Michigan Gov. Gretchen Whitmer laid out her legislative priorities during her first State of the State address on Tuesday. Whitmer briefly discussed the Flint water crisis in her speech, saying that the city’s water last month showed the lowest levels of lead contamination since the crisis started four years ago. Last week, Whitmer signed two executive orders restructuring the Department of Environmental Quality and creating a Clean Water Public Advocate. Flint Mayor Karen Weaver said that, while she enjoyed the governor’s address overall, the executive order doesn’t do enough to restore the city’s trust in government. But state Rep. Sheldon Neeley (D-Flint) said it’s too early in Whitmer’s term to criticize her. Republican members of the Michigan House of Representatives voted 58-51 last week to overturn Whitmer’s executive order because it removed the Environmental Rules Review Committee, Environmental Permit Review Commission and Environmental Science Advisory Board, which the Legislature approved last year. A Senate vote on overturning the executive order could take place as soon as this week. 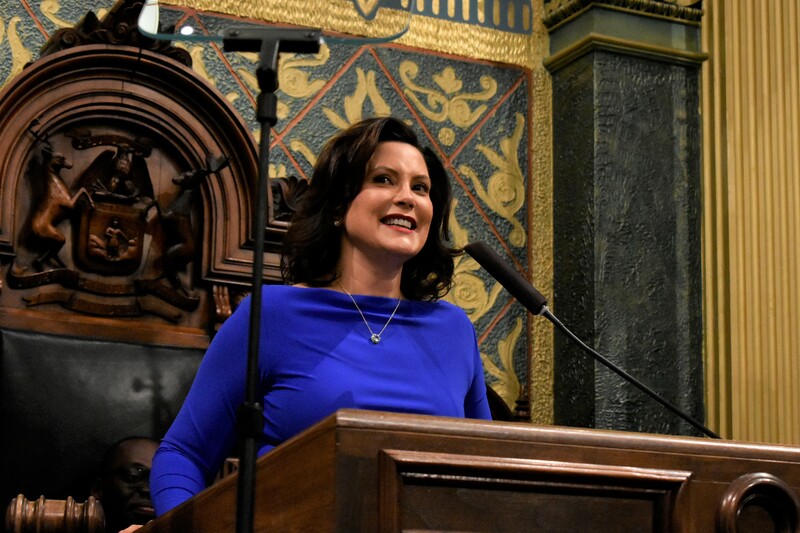 Shortly after the House vote, Whitmer asked Attorney General Dana Nessel for her legal opinion on the commissions that the executive order disbanded. “These commissions create unnecessary bureaucratic hurdles that get in the way of our state government responding to problems with drinking water quickly, and their creation may violate federal requirements under the Clean Air Act and Clean Water Act,” Whitmer said in a statement. Weaver said that she has requested a meeting with the governor to discuss revenue sharing, restoring the distribution of bottled water, and economic development opportunities. “She did talk about small businesses and entrepreneurship and the importance of supporting that, and that’s one of the things we’re seeing in Flint,” Weaver said. Before Whitmer took office on Jan. 1, the Michigan Advance reported that Whitmer would restore bottled water distribution until Flint’s pipes were replaced. After taking office, however, Whitmer declined to say whether she would push for state funding to reinstate the program once Nestle stops providing free water after April. Senate Majority Leader Mike Shirkey (R-Clarklake) and House Speaker Lee Chatfield (R-Levering) said that funding will be key to the issues Whitmer discussed in her speech, which includes fixing Michigan roads and offering two years of debt free college education for Michigan high school graduates. Whitmer will present her budget proposal on March 5. I thought about going at first but I felt it was going to be a bolo. So I never went.